Taipei Municipal Stadium is to host the opening and closing ceremonies of the 2017 Summer Universiade following the decision June 22 by city Mayor Ko Wen-je to strip Taipei Dome of the events. 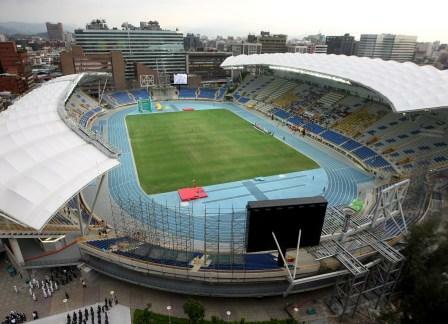 The 20,000-seat outdoor stadium, main venue for the 2009 Summer Deaflympics, is first choice for the ceremonies, with adjacent indoor Taipei Arena assuming a backup role in case of inclement weather. The mayor announced the decision while chairing a Universiade coordination meeting at Taipei City Hall. He said the adjustments were made in line with the local government’s ongoing safety concerns surrounding the dome. Taipei Dome was designated as the 2017 Summer Universiade’s main venue when the city won the right to host the event in 2011. Construction on the 40,000-plus seat stadium, as well as an accompanying high-rise office building, multiplex cinema and shopping complex, was partially suspended after a safety review released April 16 highlighted major concerns over public safety hazards resulting from a vastly expanded floor space.